Naypyidaw (VNA) – The enhancement of relations between the Vietnamese and Myanmar legislatures is one of the important pillars in political ties between the two nations, said Party General Secretary Nguyen Phu Trong. During a meeting with Speaker of the Myanmar Parliament Mahn Win Khaing Thann in Naypyidaw on August 24, the Party chief hailed the effective and practical cooperation between the Vietnamese and Myanmar parliaments, especially the maintenance of delegation exchanges and exchange activities of friendship parliamentarians groups. Vietnam always wants to strengthen cooperative relations with Myanmar and supports the country’s national reconciliation, he said. The Party leader informed the host about the outcomes of his earlier talks with President Htin Kyaw and stressed that the establishment of the comprehensive cooperative partnership has created an important milestone and new momentum to bring Vietnam-Myanmar relations to a new height, satisfying aspirations of the two countries’ people. Speaker Mahn Win Khaing Thann said cooperative ties between the legislatures of Vietnam and Myanmar have been continuously reinforced and continued reaping positive outcomes. He recalled his good impression during his official visit to Vietnam last May and highly valued the contents exchanged with Vietnam in parliamentary cooperation, especially Vietnam’s experiences in tourism development. The Speaker voiced his hope that more and more Vietnamese businesses would invest in the Myanmar market in the future. Party General Secretary Trong proposed the Myanmar parliament provide legal and policy support for Vietnamese enterprises to do business in the country. 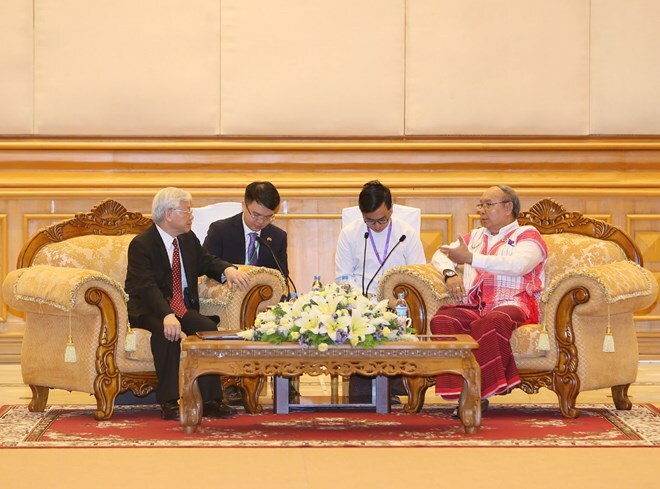 He expected that the Myanmar legislature would promote its role and prestige to contribute to the bilateral comprehensive cooperative partnership. The two leaders also shared viewpoints on building an ASEAN of solidarity, unity and strength, contributing to regional and global peace, stability, cooperation and development.